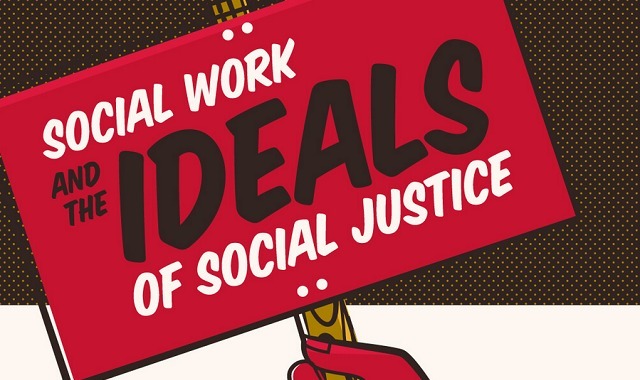 Social Work and the Ideals of Social Justice #infographic ~ Visualistan '+g+"
Social justice is the idea that every person deserves equal political, social, and economic rights and opportunities. The University of New England (socialwork) breaks these social justices into three categories: political rights (including child welfare, women’s welfare, and civil rights such as racial, religion, sexual orientation, and disability), social rights (including healthcare and housing), and economic rights (including poverty and employment). Those interested in making a difference when it comes to social justice should consider becoming a social worker. Social workers dedicate their lives to the ideals of social justice, striving to create an equitable society for all and make real positive change in people’s lives.